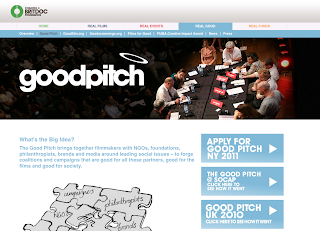 The Channel 4 BRITDOC Foundation, in partnership with the Sundance Institute Documentary Film Program, are delighted to announce that the touring funding and networking forum the Good Pitch ??" will be returning in 2011 with expanded plans, including a third forum in New York City hosted by the Ford Foundation at their midtown headquarters. The Ford Foundation joins the Tides Foundation, the Fledgling Fund, Chicken & Egg Pictures, Impact Partners, Crosscurrents Foundation and a number of anonymous donors as supporters of the Good Pitch. Working Films will continue to provide campaign development for the invited filmmakers. The Good Pitch is an invitation-only event, starting with an intensive two-day campaign development workshop for the filmmakers, followed by a day-long live event which brings together invited foundations, NGOs, social entrepreneurs, broadcasters and other media to expand the resources aimed at maximizing the impact of social-issue documentary. Filmmaking teams pitch their project and its associated outreach campaign with the aim of creating a unique coalition around each film to accelerate its impact and influence. The call for entries for the Good Pitch NY 2011 is now open and will close on Monday February 21st. The call is aimed at filmmakers of any nationality working on feature-length or hour-long independent documentary film projects which tackle important global and national issues and enhance our understanding of the world. For more information and to apply go to http://britdoc.org/goodpitch. Since the first North American event in Toronto in 2009, Good Pitch has received over 1200 applications to events in North America and the UK. Over 60 films have now pitched to more than 700 organizations, with a vast range of positive results, including over $2 million leveraged in new funding.